This practical handbook is designed to help language teachers, teacher trainers, and students learn more about their options for using computer-assisted language learning (CALL) and develop an understanding of the theory and research supporting these options. 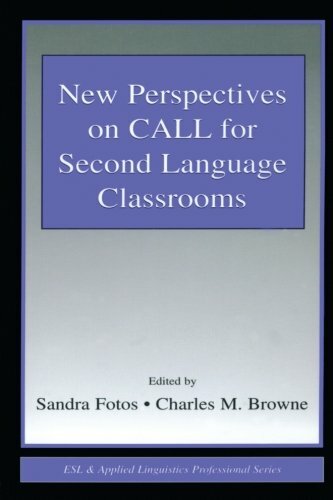 The chapters in New Perspectives on CALL for Second Language Classrooms synthesize previous CALL theory and research and describe practical applications to both second and foreign language classrooms, including procedures for evaluating these applications. The implementation of CALL at the institutional level is also addressed, with attention to designing multimedia language laboratories and creating collaborative CALL-based projects between educational institutions. Although many chapters locate their descriptions of CALL activities and projects within the ESL/EFL setting, the principles and activities described are equally useful for other language settings. The book does not require prior knowledge of CALL, computers, or software. To assist readers, a glossary of CALL terms and an appendix of CALL Web sites are provided. The book also has its own accompanying Web site (http://www.erlbaum.com/callforL2classrooms) presenting chapter abstracts, author contact information, and regularly updated links to pedagogical, research, and teacher development sites. By integrating theoretical issues, research findings, and practical guidelines on different aspects of CALL, this book offers teachers multiple levels of resources for their own professional development, for needs-based creation of specific CALL activities, for curriculum design, and for implementation of institutional and inter-institutional CALL projects.